Ten years ago today, the Honorable L. Todd Burke called his Forsyth County courtroom to order and recognized a distinguished lawyer from Lumberton, North Carolina, who had been serving the State and the Bar for fifty years and eight days. Horace E. Stacy, Jr., stood and moved the admission of his great-nephew to the Court, and asked the judge’s leave to explain the provenance of the Bible he would use to take the oath. I started becoming a lawyer at least eighteen years before that day. My fourth grade teacher assigned students to write and deliver speeches throughout the year, and one of her assignments was to talk about a famous person. She made the point that if there was someone notable in one’s family, that would be a wonderful person to pick. I sheepishly asked my mother, pretty sure of a negative answer, if there was anyone famous in our family. She and my grandmother suggested that I call my great uncle and ask about Walter Parker Stacy. Uncle Wat’s story quickly engaged me with my family’s past, and an encounter eight years later called me to a future I wouldn’t understand for a long time to come. 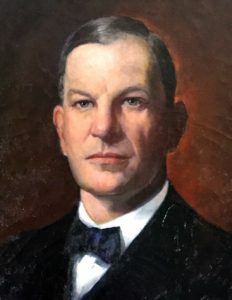 Detail from a portrait of Chief Justice Walter Parker Stacy. In a couple of long phone conversations and subsequent letters, my grandmother’s brother, Horace E. Stacy, Jr., told me about his uncle, Walter Parker Stacy, who was the chief justice of the North Carolina Supreme Court from 1925 until his death in 1951. Chief Justice Stacy remains the longest-serving chief justice in North Carolina history. His personal life, though, was tragic: he married relatively late in life, and his wife died just four years later; they had no children. Celebrity could have found Uncle Wat very easily, had he not avoided it at every turn. An enterprising researcher at the North Carolina Department of Archives and History tried to assemble the Chief Justice’s papers in the early 1970s, but the judge’s long-time assistant wrote that Chief Justice Stacy’s “thoughts were that his life’s work could best be described and preserved in the North Carolina Supreme Court Reports….” The Marshal and Librarian of the N.C. Supreme Court responded with little surprise, relating a memo in the Court files that said Chief Justice Stacy “remarked that the court should shun publicity, favorable or unfavorable: that the court’s job is the make history, not publicize itself.” The Chief Justice even recommended a comment for his obituary: “He didn’t care a damn for the trappings of his office.” The comment was not included. 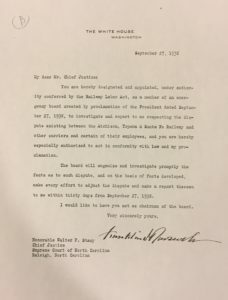 Letter to Chief Justice Stacy from President Franklin Roosevelt (September 27, 1938). He was called upon by four U.S. presidents—Coolidge, Hoover, Roosevelt, and Truman—to serve on labor dispute resolution commissions. There were persistent rumors of his appointment to the United States Supreme Court by President Hoover in 1930. Dow Jones tickers even reported the nomination, leading to numerous congratulatory telegrams in the court offices, but the rumor was no more than a representation of his extraordinary reputation after just five years leading the N.C. court. For a precocious nine year-old, the existence of such a relative was a fascinating discovery. I was able to understand the reputation and accomplishments of my great, great uncle more easily than the equally admirable lives closer to me, and I was intrigued by the possibility of carrying on a family legacy in the law. Uncle Wat visited me again when I was about to start my senior year of high school. I attended North Carolina Boys’ State, which was then held on the campus of Wake Forest University. The week at Wake Forest marked the beginning of what is now a 20-year relationship with my educational and professional home. I decided to participate in the moot court program, and so on my first day I walked into the law school in Worrell Professional Center, and spotted a plaque on the wall. Plaque from the east entrance to Wake Forest’s Law School. 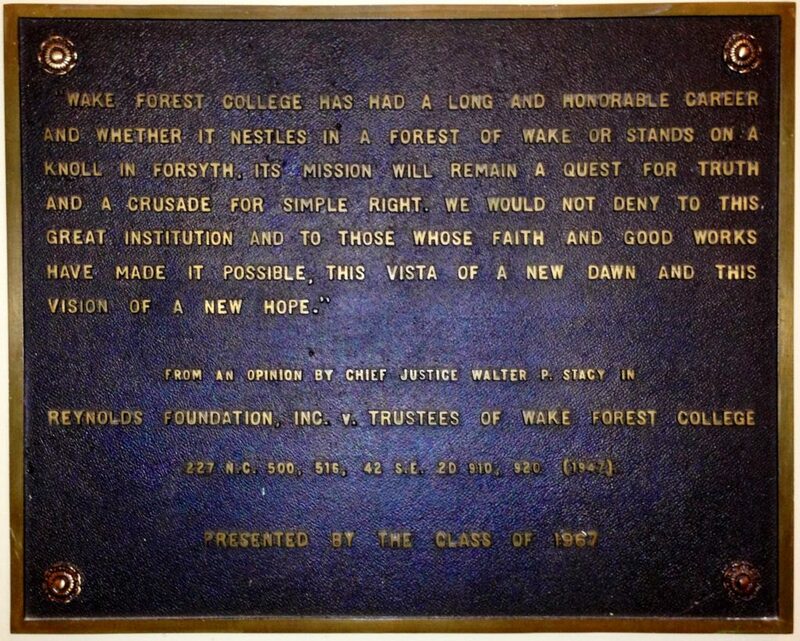 The plaque bore some of the most gracious words about Wake Forest ever written, but the attribution rocked me back on my feet: Chief Justice Walter P. Stacy. Suddenly I felt that I belonged in this new place. I found the volume of the North Carolina Reports in the University’s law library and looked up the full text of the decision containing the quote from the plaque. I’d like to say that it opened my eyes to a whole new fascinating world, but in truth I didn’t understand it very well at all: something about Wake Forest and the Z. Smith Reynolds Foundation and a contract to make gifts. My Uncle Horace later explained it to me, and I now refer to the case often with students when explaining the functioning of the court system. The plaque and the fun of looking up Uncle Wat’s opinions in the law library during the following week developed into a plan to go to law school after college. time—so although I didn’t get to see them very often, Uncle Hugh and Uncle Horace filled the role in important ways. They were both consummate southern gentlemen (Hugh was born in Ohio, but between Washington & Lee, Duke, and my great aunt Louise’s extraordinary grace and charm, he converted into a southerner in all the critical ways), and they were both the epitome of the noble attorney. Uncle Hugh had a gravelly voice that conveyed the depth behind everything he said and did. He had a fisherman’s patience and a mischievous sense of humor, making him a favorite of children around the family. His eyes had a piercing quality, but they were animated by an enduring curiosity about other people. He was a careful professional, but he showed no restraint as he invested in the people he loved. Uncle Hugh was easy for me to fall in love with and adopt as a surrogate grandfather. His home in St. Petersburg, Florida, was a long trip for my family, but it was my favorite place to travel. After one family vacation to Disney World, we spent a few days in St. Petersburg, and my brother and I told my parents that next time we’d rather skip Disney and just visit Aunt Louise and Uncle Hugh. That had a lot to do with him teaching us to fish off his Tampa Bay dock, but every moment with them was fun. 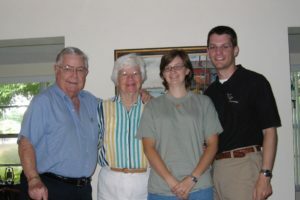 Uncle Hugh Reams, Aunt Louise Reams, my wife Heather, and me in 2007, just before they became the first family members to hear we were expecting our first child. Between visits, Uncle Hugh and I exchanged letters across a period of several years. Another of his enduring curiosities was computers, and so our correspondence converted to email in the mid-90s before most of the world knew what email was. I told him in some of those letters about my interest in being a lawyer, and he was encouraging, but I also got the sense that how I worked was more important to him than what I did. That made it easier to tell him when I decided not to go to law school after college, but instead to enroll in the divinity school at Duke. Like me, Uncle Hugh grew up with a father who modeled professionalism. Glenn Reams was a physician, and I remember Uncle Hugh telling me with deep pride how seriously Dr. Reams took his role as a caretaker in his community. He used my new career direction to illustrate this when he told me that his father never once charged a member of the clergy for medical treatment, and that he had never charged a minister for legal work either. The micro lesson was one I would eventually honor as an attorney, but the macro lesson was about the value of professional courtesy and the deeply intertwined nature of faith and vocation. He also shared the lesson that his father had known you can’t treat a patient well unless you fully understand their life. Of course, you can’t represent a person before the court without a thorough understanding of their life and affairs, which was either the reason Uncle Hugh learned so much about others or the reason he was so successful as an attorney, given his natural sense of curiosity. Uncle Horace was a more subtle figure. (Actually, I never called him ‘Uncle Horace,’ but rather used the affectionate nickname ‘Bubber’ that my grandmother had used since his childhood.) As far as I know, he stood every time a woman entered the room for 86 straight years. He was the most die-hard Carolina fan I’ve ever met, but I never heard him utter a negative word about another school. There is a dorm named after another one of his uncles at Chapel Hill, but he went to great lengths to explain the family connections to Duke and Wake Forest at the relevant points in my life. It made a deep and early impression on me to see how much my father respected Uncle Horace (and Uncle Hugh, for that matter): that told me he was the ideal of a good man and the kind of man I should be. In addition to introducing me to Uncle Wat, Uncle Horace introduced me to the broader subject of family history and tradition. He sent me clippings from the past and present, and in his last months wrote out narratives about three of the Stacy brothers from his father’s generation (including Uncle Wat). It was very late in his life that it dawned on me that he was trying to ensure an interest in the family’s great stories that would survive him, and few legacies have meant as much to me. After I passed the bar exam, Uncle Horace called to congratulate me, and he asked if he could present me to the court for admission. That required a separate ceremony, which he arranged. He drove to Winston-Salem on September 18, 2006, and brought with him an 1895 Bible given to Uncle Wat by his father, a circuit-riding Methodist minister. Uncle Wat used the Bible for every oath of office he took—superior court judge, associate justice, and for each of five terms as chief justice—and eventually left it to his brother, my great-grandfather Horace E. Stacy, Sr., who gave it to his son (my great-uncle). Uncle Horace used it for his oath of admission to the Bar in 1956. He insisted that I use it for my oath and inscribe it afterwards in the pattern of the others who held it. About a dozen lawyers from my firm came to witness the ceremony, and they were spellbound (along with the presiding judge) as my uncle, who had signed most of their bar certificates while chair of the Board of Law Examiners, told the story of the Bible and moved my admission. Stacy Bible inscriptions from 1916–2006. The Bible was also inscribed by two of Uncle Horace’s grandchildren after they used it in his memorial service in November 2015. I’ve been admitted to the bar for ten years, but I only had a “real” law practice for the first two of those ten years. I took an administrative position at Wake Forest, then a faculty appointment, and so my practice has been in the classroom and in pro bono work with the Civil Air Patrol and North Carolina Legal Aid. Almost nothing I do would be the same without my identity as a lawyer, though, and so the anniversary means something to me. Perhaps it is most important as an occasion to reflect on how I can be more like my three lawyer uncles. There are plenty of jokes about the world not needing any more lawyers, but I know the world needs more men like my three great uncles. On my best days, I hope I honor their legacies. They still inspire me.